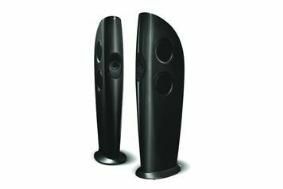 MUNICH SHOW: KEF forms technical partnership with Prodrive and launches Concept Blade speaker | What Hi-Fi? At the same time, KEF has formed a technical partnership with Prodrive, one of the world's leading motorsport and automotive technology businesses. Prodrive runs the Aston Martin racing team in the Le Mans series. As part of the deal, which runs until the end of 2009, Prodrive will assist KEF's engineers with innovative carbon fibre speaker cabinet technology, while KEF will supply Prodrive with audio components for installation and future use at the Prodrive UK facility. The unveiling of the Concept Blade is seen as a clear indication of the technical direction KEF will take in the future. The futuristic cabinet design is constructed from a carbon fibre, balsa wood composite as used in ultra-high performance cars – hence the link with Prodrive. Every component has been designed from the ground up. At the heart of the design is KEF's Single Apparent Source technology, which is said to give the Concept Blade "unrivalled coherence throughout the entire frequency range". The speaker uses four newly-developed 25cm bass drivers which are side firing so their acoustic centre coincides with those of the tenth-generation Uni-Q midrange driver and tweeter. Formed from liquid crystal polymer and backed by a large 75mm voice coil, the Uni-Q includes a 25mm titanium dome tweeter. All this technology is housed within that highly distinctive composite cabinet. So will the Concept Blade ever go into full production? KEF remains coy, only saying "this is more than just a concept. It is a tangible development of an ongoing series of KEF technologies, which will feature in many new KEF models in the future".